The perfect addition to any haunted house or horror-themed party! 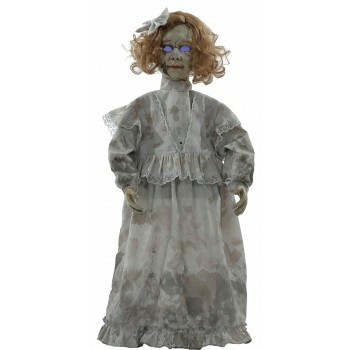 Standing at 32in tall, the hollowed-out eyes of this static dreadful doll prop will glow an eerie blue as she says one of five phrases with each activation of her motion/light sensor. Features easy quick-connect push-button assembly and posable arms. Requires 3 AAA batteries (not included).